It’s a Dutch thing, you just wouldn’t understand. In Holland, they love their herring, preferably raw, which they consume by dangling overhead, like a cartoon cat preparing to devour a squirming mouse. Unfortunately, the classically Dutch herring industry has fallen on hard times. Viewers will set sail on one of the two remaining Dutch commercial herring fishing boats in Leonard Retel Helmrich & Hetty Naaijkens-Retel Helmrich’s Raw Herring, which screens during the 2013 Tribeca Film Festival. 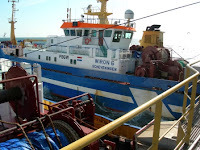 The tightly knit, religiously devout community of Katwijk is known for its tradition of herring fishing, but competition from Norwegian crews has drastically thinned their ranks. Only the Wiron 5 and 6 still venture out, often in Norwegian and Scottish waters. 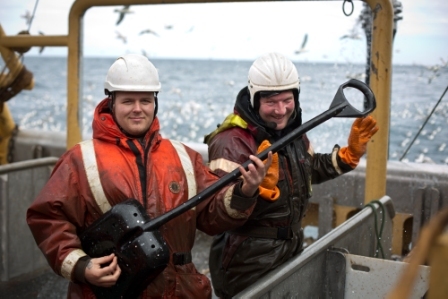 On this outing, much of the skipper’s time is spent tracking a Norwegian rival skulking nearby. The Wirons still process herring at sea, using traditional methods, but such days are apparently numbered. In fact, recording the end of the era was a primary motivation for the Retel Helmrich filmmaking siblings and their producer In-soo Radstake (a director in his own right, having helmed the intriguing Parradox). No matter how long the filmmakers hold their breath and jump up and down, critics will still inevitably compare Raw to Lucien Castaing-Taylor & Verena Paravel’s Leviathan. However, Raw has the advantage of being comprehensible. Frankly, Leviathan (on which Leonard Retel Helmrich happened to serve as an uncredited technical advisor) seeks to disorient, whereas Raw presents a vivid sense of the Wiron environment and captures some striking images. Their scenes of gulls diving underwater in search of fishy prey are particularly impressive. In further contrast, Raw is also conveys the personalities of the Wiron crew, while remaining strictly observation in approach. We see these rugged, inked-up men praying before each meal. Of course, they are still sailors, so you know what that means. Raw is not the Dutch version of a History Channel reality show. Nonetheless, it is mindful of the dangers of the job, beginning with the dedication to a monument to Katwijk fishermen lost at sea. Arguably, it bears closer comparison to a more accessible Castaing-Taylor documentary, Sweetgrass, which has its merits. Yet, the periodic flashes of earthy humor and some of the incredible shots primary cinematographer Leonard Retel Helmrich pulled off further distinguish Raw Herring. Recommended for patrons of you-are-there-style documentaries, Raw Herring screens again tomorrow (4/20), Wednesday (4/24), and next Saturday (4/27) as part of the World Documentary Competition at this year’s Tribeca.